Older patients with kidney failure need to be aware of the treatment options available to them. Start discussions on the possibilities early in the course of chronic kidney disease to avoid the need for hurried, uninformed decisions. Since becoming available in 1960, dialysis maintenance treatments have added countless years to the lives of millions of people with kidney failure. While it’s not a cure, the process of cleansing the blood of toxins represents a major technological advancement in life extension, one that remains vital to kidney transplant candidates facing a multiyear waiting list. But many elders choose dialysis for its critical ability to extend life through fluid and waste removal from the blood. However, the physically taxing procedure can be burdensome even for young and otherwise healthy individuals, and many of the challenges and problems related to dialysis are magnified in older adults. This is especially significant because, according to the Kidney End-of-Life Coalition, 45% of the more than 320,000 patients receiving dialysis therapy in the United State are over the age of 60. Manjula Kurella Tamura, MD, MPH, a nephrologist and assistant professor of medicine at Stanford University School of Medicine, reports the fastest growing segment of the dialysis population to be among patients aged 75 and older. The growth rate of this age group is estimated to have increased by more than 50% in the last decade, giving rise to both concern and controversy among physicians who deal with older dialysis patients and their families. Studies of aging patients and their dialysis outcomes prompt a compelling question: Just because the procedure can be done, should it be done? This leaves the choice between dialysis and nondialytic treatment with dialysis divided into the subtypes of hemodialysis, performed over several hours at a clinic three times per week and peritoneal dialysis done in a home setting on a daily basis. “For most patients, they’re roughly equivalent,” Kurella Tamura says. “So the choice is really a quality-of-life issue or a personal preference issue. “For patients who aren’t independent enough to manage the treatments or don’t have someone to assist them, hemodialysis is probably the better option. To complicate the issue slightly, there’s a growing interest in doing hemodialysis at home. That requires more training up front because you’re accessing the bloodstream, and some patients can get nervous about doing that themselves at home,” she says. This method requires that patients be highly functional and have a caregiver at home. To avoid a scenario where older adults feel pushed into a hasty decision to begin dialysis, physicians should start discussing options early in the course of chronic kidney disease. A palliative medicine team—a group including doctors, nurses, and often chaplains, found at between 30% and 70% of hospitals across the country—also plays an important role in patient support, addressing both physical and psychological symptoms. Ann Russ, PhD, a medical anthropologist who conducted interviews among renal dialysis unit patients aged 70 and older and their families for several National Institutes of Health projects undertaken with Sharon Kaufman, PhD, at the University of California, San Francisco, describes both dialysis initiated in an emergency situation and, more commonly reported, a passive acceptance of dialysis that contrasts with a proactive choice of these treatments. Although dialysis effectively addresses one significant problem, other related difficulties arise. “Older patients who are on dialysis continue to have a very substantial burden of unpleasant symptoms, ranging from pain and physical disability to poor appetite, poor energy and functioning, depression, cognitive impairment—lots of those issues,” says Kurella Tamura. “But how they view their quality of life is something different. Older patients seem to adapt to those problems better than we healthy people think that they will. While some patients are willing to accept those physical limitations for the potential extension of life, other patients do very poorly and wind up withdrawing from dialysis because the burden of symptoms is so large it makes the quality of life so poor that they don’t want to continue.” Posttreatment fatigue, dizziness, and nausea, all commonly reported, can lead older patients to question the value of dialysis. Hemodialysis patients may become disheartened by having to spend so many hours away from home, and a lengthy commute to a dialysis clinic can turn a tiring three-hour treatment into an exhausting five- or six-hour ordeal. Physicians caring for these patients build that discussion into their care for their patients with kidney disease. The dialysis decision also involves a patient’s family and their committed support. A physician-led French study that appeared in the Clinical Journal of the American Society of Nephrology suggests that strong social-support networks, including family and friends, have a positive influence on dialysis patients, who were more likely to follow doctors’ orders, maintain dialysis, and experience a better quality of life. They were also less likely to die prematurely. Data on 32,332 dialysis patients at 930 facilities in 12 nations were analyzed in this study, which reflects some country-to-country differences. 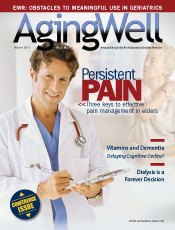 A patient’s geriatric care manager can also play a significant role. Professional geriatric care managers are a small but growing professional group that helps older patients navigate and coordinate their own care. An 84-year-old client of Bergman’s wound up in the hospital and started dialysis after a long-time avoidance of treating his kidney problems. “He was in such a weakened state that he fell and broke his hip, and he had a ministroke,” she says. However, he was ambulatory with a walker when he returned home from the hospital and was able to take a cab to the clinic. When that became too expensive, Bergman helped him fill out an application for Access-A-Ride, New York’s paratransit system. “And that brings other issues. Once you become dependent on the public venue, you have to have patience. If you’re not exactly on time, they [drivers of public vehicles] leave.” Any complications or slight delays in treatments may cause patients to miss an appointment for the ride home, adding another stress factor to the day. On the other hand, relying on family members for transportation can also become burdensome when dialysis continues for a long time. Essentially, the success of dialysis often comes down to how patients function after they start dialysis. “Something that’s really important to older patients is trying to maintain their independence,” says Kurella Tamura. Unfortunately, that’s something most older dialysis patients are unable to do. “They tend to experience a continued decline even after they start dialysis,” she notes. Before beginning dialysis treatments, providers must examine older adults’ other health issues and their relationship with dialysis. “In this population, who have other geriatric syndromes, some of these factors may be more responsive to dialysis than others,” says Kurella Tamura, citing cognitive impairment or failure to thrive as possible indicators of conditions other than kidney disease—conditions that may not warrant starting dialysis. “We have to ask about the patient’s life expectancy and quality of life with dialysis. We know that the average 85-year-old starting dialysis has a life expectancy of 12 months. Our study provides some information about what we can anticipate in terms of functional capacity. Tools such as comprehensive geriatric assessment are useful for estimating functional age in addition to their chronological age,” she says. It’s important to recognize patient treatment goals, whether that means an interest in symptom management, staying out of the hospital, or doing anything possible to extend life. The expanded and revised second edition of the Clinical Practice Guideline on Shared Decision-Making in the Appropriate Initiation of and Withdrawal From Dialysis, released in October 2010, is available from the Renal Physicians Association (www.renalmd.org). This guide can be a useful tool for physicians working with patients at every stage of dialysis, starting with a focus on communication challenges and effective strategies in discussing prognosis and treatment options with both patients and their families. — Lenora Dannelke, a freelance journalist and author in Allentown, Pa., writes about health-related issues as well as food and nutrition articles for numerous publications. Older adults with kidney failure receive kidney transplants more often than they did a decade ago, according to a study appearing in the Clinical Journal of the American Society of Nephrology. The results suggest that the chances of receiving a kidney transplant are better than ever for older patients who need one. Kidney failure afflicts nearly 500,000 individuals in the United States, and 48% of such patients are aged 60 or older. Kidney disease patients who receive a transplant live longer than those who remain on dialysis. Fortunately, living and deceased organ donations are on the rise; however, transplant waiting lists have become increasingly long as more individuals develop kidney dysfunction. Researchers examined whether older patients with kidney failure have better or worse access to transplants now than they had in the past. The study included patients in the United States aged 60 to 75 with kidney failure who were listed in the U.S. Renal Data System between 1995 and 2006. The study revealed that older patients rarely receive a transplant, but they were twice as likely to get one in 2006 compared with 1995. (In 2006, elders had a 7.3% likelihood of receiving a transplant within three years of their first treatment for kidney failure.) Older patients now benefit from greater access to organs from living donors and older deceased donors compared with a decade ago. They also die less frequently while waiting for a kidney than they did in the past. The authors urge clinicians to encourage older patients with kidney disease to consider transplantation over other forms of treatment. “Early engagement and education of patients and their families about the benefits and opportunities for transplantation may lead to further increases in the use of ... transplantation in this age group. Policy changes and research are also needed to further expand access to transplantation in the elderly,” they wrote. A diet designed for patients with chronic kidney disease can help prolong kidney function and delay the need for dialysis. To maximize the benefits of nutritional awareness, it’s beneficial to refer patients to a dietitian early in their treatment. Physicians can utilize a dietitian to help patients plan specialized diets to address the particular needs of hemodialysis and peritoneal dialysis patients as well as diabetic patients on dialysis. Blood tests may be necessary to monitor levels of sodium, potassium, and phosphorus, three minerals that need to be limited in patients with chronic kidney disease. DaVita.com, the website of DaVita Inc, a kidney care provider, offers diet and nutrition information, along with meal plans, recipes, and a Kidney Diet Tips blog that patients and their families or caregivers can access at no cost. A searchable food analyzer draws on an enormous database to deliver full nutrient information for both fresh and commercially prepared foods, from apples to zucchini muffins. Recent studies claim multiple health benefits of pomegranate juice, including that it’s a good source of antioxidants and lowers both cholesterol and blood pressure, especially in diabetic and hypertensive patients. A preliminary study now suggests that it can ward off several complications in kidney disease patients on dialysis, including the high morbidity rate due to infections and cardiovascular events, according to a paper presented at the American Society of Nephrology’s recent annual meeting. Batya Kristal, MD, FASN, an associate professor of medicine and head of the department of nephrology and hypertension at Western Galilee Hospital in Haifa, Israel, and colleagues studied 101 dialysis patients who received either pomegranate juice or another placebo drink at the beginning of each dialysis session, which occurred three times per week for one year. Laboratory tests showed that patients who drank pomegranate juice experienced reduced inflammation, and oxidative stress damage caused by free radicals was minimized. Furthermore, pomegranate juice drinkers were less likely to be hospitalized due to infections. These findings support other studies that suggest pomegranate juice has potent antioxidant properties. Recent analyses of data not included in this abstract revealed that those who drank pomegranate juice also showed improvement in cardiovascular risk factors, such as reduced blood pressure, improvement in lipid profile, and fewer cardiovascular events, suggesting that they had better heart health. These results coincide with other studied populations and are particularly important for hemodialysis patients because most kidney disease patients die either from cardiovascular-related causes or infections. The authors say their findings suggest that drinking a controlled amount of pomegranate juice with a safe and monitored potassium content may help reduce the complications that often occur in dialysis patients. It is important to consider the risk involved in potassium overload, especially in chronic kidney disease (CKD) patients with dietary potassium restriction. “Considering the expected epidemic of CKD in the next decade, further clinical trials using pomegranate juice aimed at reducing the high cardiovascular morbidity of CKD patients and their deterioration to end-stage renal disease should be conducted,” says Kristal. Explain to prospective dialysis patients the taxing nature of dialysis treatment and the significant burdens that accompany it. Initiate discussions of treatment possibilities early following diagnosis of older patients’ kidney disease. Encourage dialysis patients to promote family and other support networks to assist with various aspects of treatment and provide emotional reinforcement. Paint a realistic picture for potential dialysis patients, detailing advantages and disadvantages of conservative treatments as well as committing to dialysis. If the situation and patient’s condition warrant, remain open to the possibility of a kidney transplant.